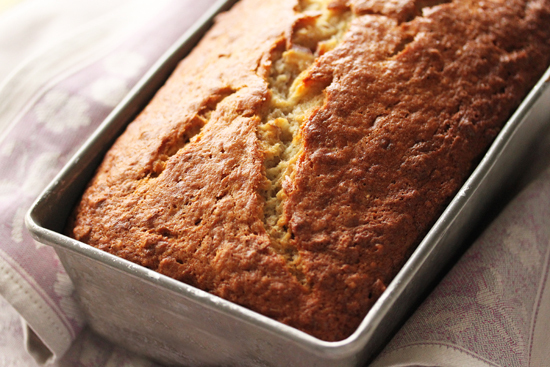 My Mom used to make Banana Bread when I was a kid from a recipe in her Betty Crocker Cookbook. It was dense and good, and we would top it with a spread made of cream cheese and crushed pineapple mixed together. 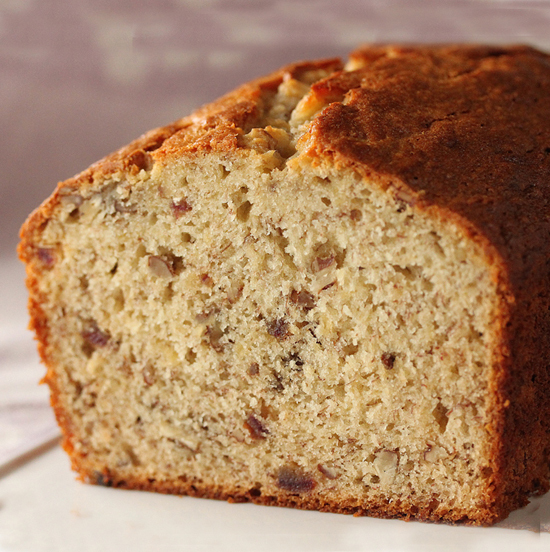 Banana Bread is definitely a comfort food for me, which I have needed in my life lately for some reason. Maybe because winter seems to be going on and on, or I’m in the middle of a law suit about my roof. Who knows. Today I needed Banana Bread. Slathered with cold butter. This recipe I got from a friend about 30 years ago. She brought it to a Pot Luck where we worked and after just one bite, I knew I had to have the recipe. It was moist with a soft crumb texture that melted in my mouth, not dense like the banana bread I had grown up with. I was so lucky she shared this recipe with me and it has been my go-to recipe ever since. Sorry Mom. The dates were not in the original recipe, but were added by me to jazz it up a little. The dates give it an almost liquor-like flavor. However, if you are not a date person, leave them out, or add a half cup of chocolate chips. Be creative. But make this for sure. You’ll be really glad you did. 1. Preheat oven to 350 degrees F. Grease bottom of 9×5x3 inch loaf pan. 2. Chop the nuts and dates. Set aside. 3. Smash peeled bananas on a plate with a fork until no lumps remain. 4. In a large bowl, stir together the wet ingredients thoroughly with a fork. Add the sugar and mix in. 5. Add the Bisquick and stir until moist. Beat vigorously for 1 minute until no lumps remain. 6. Mix in the nuts and dates until evenly distributed. Pour into pan. 8. Remove from pan and place top side up on a wire rack. Cool completely, about 2 hours, before slicing. 9. Store, wrapped, at room temperature for up to 4 days, or refrigerate up to 10 days. Note: You can leave out the nuts and/or dates, or add ½ cup chocolate chips if you prefer. seriously cream cheese with pineapple? oh my goodness that sounds so delicious. i’m the kinda gal who eats carrot cake just for the cream cheese frosting. dates? hmmm what a creative twist. You’re going to think I’m nuts, but I’ve never used Bisquick. I just Googled it and found a conversion that said “One cup of Bisquick can be substituted by a mix of one cup of flour, 1½ teaspoons of baking powder, ½ teaspoon of salt, and 1 tablespoon of oil or melted butter.” To convert this to 2 1/2 cups, I’ll need my calculator. . . It would be a heck of a lot easier to just to buy the box. My mother in law makes a mean banana bread. Definitely one of my favorite comfort foods. 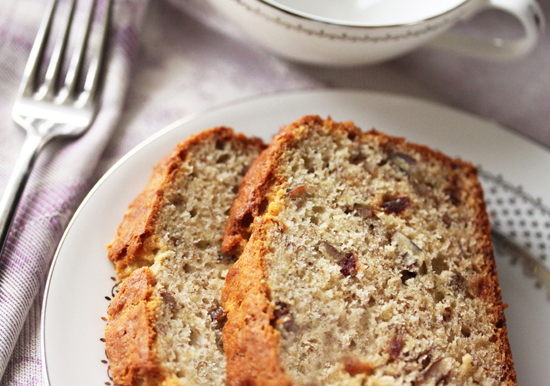 Banana bread is comfort food for me too. And the Lord knows I need more of that. Thanks for sharing this with me tonight. Food and cooking has brought me much comfort during these hard days. Your blog is a burst of brightness. I hope you have a happy and safe Wednesday. Hug the ones you love! Bananas & Dates – what’s not to love? Looks wonderfully moist and as always I just love your photos. I will have to agree with you here, wonderful comfort food…looks so moist and delicious.